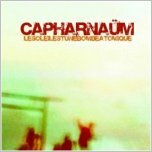 Review: "Capharna�m: Le Soleil est une Bombe Atomique" - Sea of Tranquility - The Web Destination for Progressive Music! Don't let the French title � which, translated, means "The Sun Is An Atomic Bomb" � throw you. This is nitty-gritty, guitar-driven, modern and melodic instrumental rock. And because it's released by Quebec's increasingly relevant Unicorn Digital label, it comes with a progressive twist, courtesy of a Canadian quartet that has been active for more than a decade but didn't record its first album until 2006. The fact that many (if not all) of the 10 dual-guitar songs on Le Soleil est une Bombe Atomique must have been simmering for years makes them sound so complete, wrapped in velvety textures, complex rhythms and concise structures. Not so much aggressive as confident, the members of Capharna�m nevertheless sound as if their lives depend on each successful note played. The Quebec band members have been playing together for nigh on ten years now between other work and musical projects with only one previous release in 1999. This, their first full length studio album of guitar instrumentals reminds me of a more controlled version of fellow French Canadians from just up the road in Montreal, Spaced Out. Twin guitars, bass and drums deliver a vivid set of ten compact compositions, very evocative in the main of their track titles. After the vibrant opener, "Atomic Disco", "Tokamak" (a kind of magnetic coil used in fusion reaction if you're interested) takes a more acoustic leaning with some neat interplay between the 12 string-sounding rhythm and the crystal clear electric guitar. As it suggests "Dementielle" contrives to conjure a more hard hitting scene whilst "Feedback" runs through a number of dark and light moods with delicacy and dissonance in equal measure. "Un Dimanche soir a St-Zenon" has a laid back feel to it, no doubt suitable for lazing on a Sunday afternoon. The second half of the album begins with an altogether different sound, a hollow bass texture which surrounds the percussive, jittery "Caterpillar", a fascinating sonic attack which for my money is the most interesting piece on the album. The twin guitars are used very effectively throughout the album and especially on the fast-paced "Delirium", with its contrapuntal arrangements, which has a blistering approach to the finishing line. "Jouer encore" starts with guitar work which could be forgiven for being mistaken for a violin, then develops intriguingly into a strange mix of nervous picking, flamenco motifs, reflective acoustic parts and spacey Floydian chords. Its certainly the oddest piece on the album, contrasted with the rather less complex but grungey closer, "Brainstorm", the track which most closely resembles the aforesaid Spaced Out's style. Overall, there is a freshness and joy to the work here and the music, although having prog influences, is modern sounding and engaging. A solid job lads.